Your life after NYSC begins now after reading this article as a Nigerian graduate and I want to say a very big congratulations on being steadfast and taking 12 months of your life to serve our fatherland. The National Youth Service Corp scheme has recently come under criticism for being unimportant, while I do not agree with this thought what I would rather love to see is an upgrade of the scheme and optimised in a way that benefits the individual and our national labour force. Let me take you back to the crux of the matter, what do you have planned for your life after NYSC, what’s next for you? Since after completing my NYSC in 2012, the following tips I have learnt will help you be on a better path, please read and share. Your path and life after NYSC would be determined by how much investment you have made on your skills. Are you interested in a career or being an entrepreneur, spend the time to find and discover yourself, passions and interest? The best way to do this for a career is to take on several quarterly internship opportunities in your areas of interest and if you are interested in business, find someone doing a similar thing you want to go into, learn from their mistakes to have a better head start. Fear should motivate you rather than stop you. There are jobs for you when and if you have the right skills-set, ensure you are employable. You can take skill and employability training to improve your knowledge and ability to land a job. You find a job, just prepare yourself and don’t fret. For most people, your parent and uncles you could get off extra money off will no longer be easily available and even if you had your own source of income, this is time to invest yourself in more prudent lifestyle. Cut your expenses and save as much as possible, you will be thankful you did this later. Start small, invest in a good CV, good job search profile, learn all you can about the interview process and be specific in your job search. If you have interest in Customer Service role, focus your application on jobs in those areas but also remember to start small. Internships are a great entry into building a career. Network and find a mentor as soon as possible. Invest in other activities that keep your physical and mental health in shape. 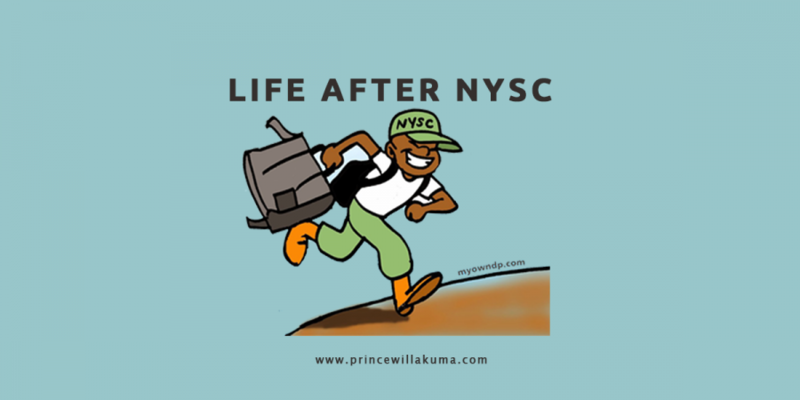 Life after NYSC can come with a lot of depression, anxiety and stress arising from the pressures of job search. I have been there and I can tell you, you need to be in good health both physically and mentally. This would help handle the stress of job search and a job when you eventually find one. If you feel overwhelmed either by your search or on a job, speak up there’s no stigma in doing so. The way we perform at school is never the way to perform in life. Life is so much more about the process, not anyone destination any one destination. Grades are important but temporary, the right knowledge, skills and experience will see you further. I am giving out 20 LinkedIn and Jobberman profile page reviews to help optimise your job search chances, if you passed out from NYSC today click the video link below, follow the link in the description and I would revert back to you.